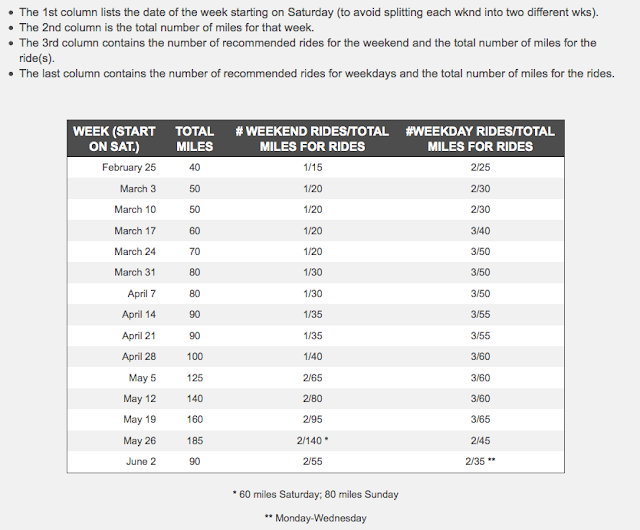 Here is a training schedule to prepare for a week-long bike tour held in Colorado every June called Ride the Rockies. Sometimes they take this page down, especially in the off-season, so I wanted to copy it here for reference. This is what I generally use to increase my bike mileage gradually. I've never actually completed this entire schedule nor have I ever participated in Ride the Rockies, although I strive to do both. I think the farthest I've gotten is Week 5 or 6 before I start lounging, lose all my fitness, and have to start over. When I do stick with it, I notice a HUGE increase in my speed. I also tend to incorporate sprints into the earlier rides (sprint every other telephone pole, or a long farm block) and in the spring I did a monstrous hill once or twice a week. So all that helped significantly. I don't think I have time to add the hills right now because I've started running again twice a week, but we'll see. Also, with vacations, holidays, and winter weather approaching, I have no idea how far I'll get this time around. All credit goes to the Ride the Rockies folks. This is the plan I use and it works. Gary, I agree. This thing totally works. Thanks for reading!